At the end of last semester, Dr. Leon asked us to comment on a general prompt: What difference does new media make to doing history? After a course that had some hands-on elements combined with a lot of exploration of what others have done (and even some new media theory), we all commented that it makes a large difference, particularly in how we, as historians, present our work. Now, in this course that strongly emphasizes the hands-on, nuts-and-bolts of basic digital history (the advanced coding awaits many of us next semester), I’m really seeing what a difference the digital makes. This week’s readings and TED videos (scroll to April 2) really help drive the point that historians–and everyone else–have a wide range of new tools at our disposal. As my classmates and I have previously commented, that also means we need a range of new skills and new considerations in doing our work. Among those skills is design, so this week we revisited the book White Space Is Not Your Enemy. This was after a near-semester of not just reading about design but doing our own and critiquing that of others. Having picked up some design principles by osmosis previously, but not in a structured manner, I found this book valuable–not only from a “wow, was I doing that wrong!” perspective, but mainly because it offers a lot of good pointers in an accessible way. If anyone is looking for a crash course in design, I’d strongly recommend this book. Being the in-house designer for basic things at my office, I feel like my “eye” has improved over the course of the semester. Design is not just about making things pretty, but making them accessible–meaning making them approachable by people of all sorts of cognitive and physical abilities. The other readings focused on doing just that. One of the most important pieces of advice is dealing with links, making sure they are obvious through underlining and using a contrasting color. People of all physical and cognitive abilities, meanwhile, will lose your messages and content without proper information architecture. As we’ve discussed frequently, just as we organize information differently if we are creating a museum exhibition, academic monograph, documentary film, and lecture, we organize it differently for online presentations. In this case, like with any of those others (possibly excepting monographs, although we all complain about how ghastly so many of those are! ), we only have a certain amount of time to hook our audience, whether that audience member is reading, watching, listening, or interacting. The articles we read (here and here) gave some good tips for how to organize information, and present visual cues, in an online medium. The two TED videos we watched, meanwhile, showed us some of the possibilities that new media raise for our work as historians, through using different means to convey our information. Lawrence Lessig talks about how digital technology, in a reverse of a century of technological advancement, is allowing us to bring back what he calls read-write culture. The problem he rightfully identifies, and indeed on which he has hung his shingle, is that copyright law has not kept up with the technology. As some of us commented last semester, what historians have done all along is a form of read-write culture. We’re taking our sources–be they documents, books, recordings, material culture, or what-have-you–and remixing them into an analysis/narrative to answer a question. We, like other creators, have greater tools now not only to do so, but to do so more transparently. For example, when we create archives and exhibits with Omeka, we are essentially remixing materials to create something new. As we discussed last semester, that act of arranging is in itself making an argument, not to mention whatever interpretation we put on top of it, in whatever form that interpretation takes. One of my favorite portions of Rosling's talk came when he broke out wealth within various countries. Here's my not-so-good visualization of El Salvador's wealth disparity: Top is a scene from my village, San Lorenzo (taken by me in 2003). 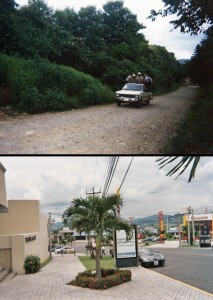 Bottom is a scene from La Zona Rosa, one of the wealthiest areas of San Salvador (taken by me in 2005). Digital technology allows us to interpret our primary sources, data, and analysis in more dynamic ways, as Hans Rosling demonstrates brilliantly in his TED talk about debunking myths of the Third World. I was mesmerized watching this video, not only because of an interest in the subject but because of how Rosling conveyed his information. I learned a lot in a short time through his dynamic presentation and impressive visualizations. I can see these statistics in my head. I’m more likely to remember them from his way of presenting than from, say, having them written up or put in tables in The Economist. The animations to show change over time were, in particular, valuable to us as historians. Although I’m with Claire in not necessarily wanting to spend all the time on the calculations and programming that must have gone into Rosling’s presentation, I nonetheless found the talk inspirational. In giving tours at the Alamo and the historic Adas Israel synagogue, I’ve struggled to convey change over time. Pictures help; but nonetheless, I’ve wondered if my visitors have been able to visualize the spaces at different periods. In these cases I’m only trying to convey change over time in physical structures; what about change over time of concepts, of historical processes? This presentation showed some ways of making those changes visible, and thus more accessible to broad audiences. As I work toward my final project, due in draft form in three weeks, I know that I have a lot to consider. Besides the project’s integrity as a piece of rigorous history, I need to present it in an accessible, appealing way. When we write even term papers, we have to consider how accessible we make our information. New media adds new challenges of accessibility to consider–but also new promises of access by a wide range of people. These are challenges I’m looking forward to tackling over the next few weeks. This week I commented on blog posts by Megan and Claire. I feel you do an excellent job in tying everything together, from our lessons in Clio I and White Space is Not Your Enemy to the TED lectures and Visual Explanations. From Clio I, we learned of digital history’s power. New media democratizes the discipline, especially as more and more people become familiar and proficient with the technologies. Furthermore, new media challenges practitioners to think about how they want to tell their story. Traditional scholarship offers a linear story, but new media provides the potential for practitioners to tell a story from a non-linear perspective. Yet, to do so, people have to think about their audience, and how their audience would explore the story at hand. This semester, we are working to apply those themes from the previous semester. White Space is Not Your Enemy teaches us, I think, valuable lessons on how to keep your audience’s focus. Equally important, the book also teaches us tips that can help us convey a certain mood, whether through color schemes, text placement, or font usage. Thinking with Type did a great job in offering tips that helped us think along those lines. After all, as we work on the design assignment and work towards the final project, we have to find ways to create the mood of the era we are examining. Design can further the argument we are presenting, but so, too, can the photographs. As you point out, images can show how things changed over time. Images can also be used in order to provide statistical evidence to support arguments, much like Edward Tufte showed when examining the Challenger tragedy in Visual Explanations. Images, much like design, are not simply used to make things look pretty. Instead, images also have the power to advance your argument, adding something to your discussion. This week I found myself completely uninspired by the readings, websites, and videos. But reading your blog actually made the material discussed this week seem more meaningful to me than the readings themselves managed to do. Well done! In attempting to tie all of this information together for a successful final project I find myself a little overwhelmed. I know that we can’t expect to be experts at all of the best practices of design and digital media, but there are so many moving pieces.